The Professional Regulation Commission (PRC) has released today the list of passers for May 2015 Real Estate Broker board exam. Kenneth Gelonga Gersabalino from University of the Philippines (UP) - Visayas Iloilo led the the 5,220 successful examinees with 86.50 percent grade. 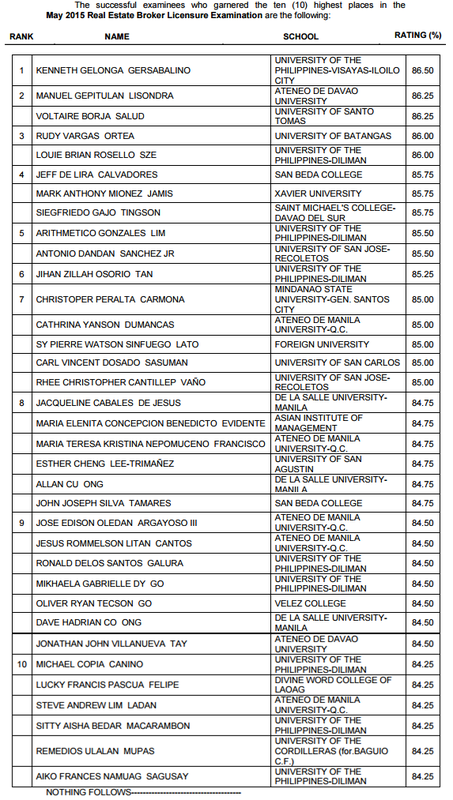 Ateneo de Davao University (AdDU) alumnus Manuel Gepitulan Lisondra and University of Santo Tomas (UST) grad Voltaire Borja Salud tied on the second spot with identical grade of 86.25 percent.